The damage to the British Airways 777 was extensive. Usually after any kind of incident on an airliner, reporters interview distraught passengers who are only all too willing to relay how hellish things were on the doomed jet. These sorts of interviews make for great television because our brains instinctively fill in all the missing bits of drama that we know must have occurred. After all, we've seen this script played out for years in aviation disaster movies. The engine failure, aborted takeoff, and fire which occurred on a British Airways 777 in Las Vegas last week, however, was the real deal. Every pilot's nightmare. If Sully's river landing was the miracle on the Hudson, this should be called the Vegas miracle, because those people may not know how truly close they came to being incinerated on that airplane. Of the 157 passengers and 13 crew aboard, there were only 13 minor injuries. After being incredibly unlucky enough to experience an uncontained engine failure, the odds of which happening are vanishingly small, everyone on the airplane got lucky in that it happened early in the takeoff and that the fire department was very quick to respond. Reports have it that the flames were extinguished a mere four minutes after the aircraft first reported trouble. Kudos of course have to be given to both the pilots and back end crews who no doubt had a large part in determining the positive outcome of this potential disaster. Much opprobrium has been ladled out, however, to some of the passengers who grabbed their luggage before exiting the escape slides. I'm willing to give a small pass to those folks who might have grabbed their under seat items such as purses, but not so much to those who took time to open the overhead bins to grab rollaboards. Their actions might well have prevented someone behind them from getting out at all. The NTSB is reporting that there were several breaches of the engine casing and that several parts of the high pressure compressor spool were found on the runway. What this means is that the engine threw itself apart, most likely due to some sort of flaw or failure in a compressor blade or the spool that holds them. This failure will likely be a high interest item as failures of this sort are not supposed to happen. These engines are constructed of high strength steel and titanium. Other than spinning on their bearings, the compressor parts are essentially non-moving parts unlike, say, the pistons in your car. Jet turbines are the most reliable of all engine designs, and I wouldn't be surprised if this failure is tied back to an undetected crack or casting flaw. When you look into the mouth of a jet engine, you are seeing the fan blades. Behind the fan blades are multiple sets of hundreds of more blades, each subsequent set together making up the compressor section. The compressor feeds very high temperature and pressure air into the combustion chamber where it is combined with fuel and ignites. Hot exhaust gases then travel over multiple sets of turbine blades which are connected to a shaft which turns the compressor and fan. It is the rotation of the fan which produces most of the thrust. That's a simple explanation of what happens normally. Engines are designed so that should a failure of any component in the core of the engine fail, the casing of the engine is designed to contain the flying parts. In fact, during engine certification, explosives are attached to fan blades and detonated while running at full power to demonstrate this capability. Because there were breaches of the engine casing, this failure is considered "uncontained". The dangers of uncontained failures are manifest including parts being flung into the cabin, other engines, or the wing where the fuel is stored. In 1996 several passengers were killed by parts thrown from a catastrophic engine failure on an MD-88 during takeoff. That aircraft has the engines attached to the fuselage. The most famous uncontained engine failure was probably that of United 232, a DC-10 bound from Denver to Chicago in July of 1989. While at cruise, the tail mounted engine suffered a failure in the number one fan spool due to metallurgical fatigue. Thrown parts severed the lines in all three of the aircraft's hydraulic systems rendering all of the jet's flight controls useless. Manipulation of the throttles on the two remaining engines allowed the pilots to make a controlled crash at Sioux City which minimized casualties. Reports from the incident indicate that the aircraft had barely rolled 1000ft before the engine failed and they rejected their takeoff. This means that the abort was a relatively slow speed one. Having the engine fail so early in the takeoff was fortuitous. Had it happened at a speed closer to V1 or decision speed, it would have been more difficult to stop the airplane and they would not have had the use of the reverser on the failed engine. Having the engine fail right after getting airborne might have been the worst case scenario. Rejecting a takeoff, the terminology used when stopping before being committed to flying, is not in itself a particularly difficult maneuver, and is practiced routinely in the simulator by all airline pilots. Automatic brake systems help by applying full braking when the throttles are closed. Likewise, having an engine fail directly after lifting off, known affectionately by pilots as a "V1 cut", is also practiced often in the simulator. Once stopped, one of the more vexing decisions pilots can face is determining whether or not to evacuate their aircraft. It really isn't as clear cut as it may seem. Calling for an evacuation will nearly always result in at least some minor injuries while the potential always exists for more serious ones. Passengers, like cats, will tend to run in all directions and are at danger of being hit by responding emergency vehicles during a full blown evacuation. There are many situations where keeping passengers on the aircraft might be the safest course of action. After any rejected takeoff, and especially after a high speed one, there may be some smoke from the tires and brakes. This doesn't mean that a fire is imminent. If emergency response vehicles are already at the aircraft to monitor the situation, an evacuation may not be the wisest choice. Flight attendants, who will have the best information concerning smoke and fire in the cabin, are empowered to initiate an evacuation on their own. That may be what happened here. 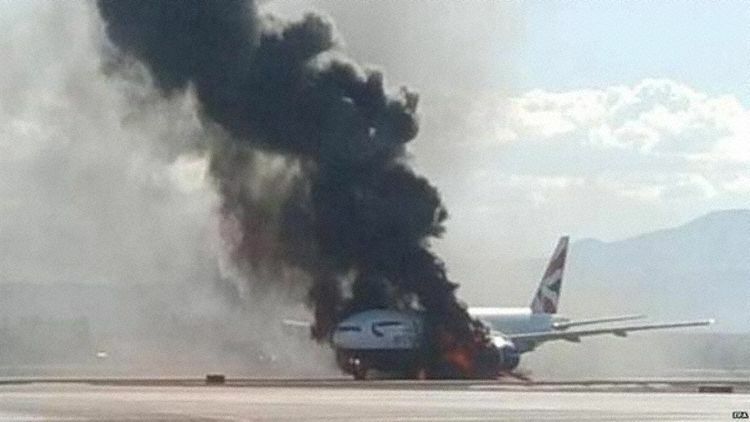 Passengers interviewed afterwards reported a loud bang followed by the aircraft slowing and smoke entering the cabin. Whoever made the call, it appeared to be well executed save for those carrying luggage. The most dangerous type of evacuation is the self or passenger initiated one as happened last week on an Allegiant flight after someone thought they saw a fuel spill. The danger here is the contagion of panic to the rest of the airplane. This scenario has a great likelihood for injuries. I'd bet against it. Heat strong enough to melt plexiglass windows and burn through aluminum skin may have compromised the structure of the aircraft to where repair is not cost effective. This aircraft was delivered in 1999 and while not ready for retirement at 16 years of age, was not new. There were also some breathless reports by the crack aviation teams on network news that the fire suppression system was used but did not work. Those systems consist of a bottle or two of Halon and are designed to extinguish a flame in the accessory drive compartment. As the Halon works by denying oxygen to fire in the enclosed spaces of the engine, it clearly wasn't designed to put out a fuel fed fire engulfing the engine. Fuel lines may have been severed by the engine failure as well. Having an engine come apart in as dramatic a fashion as this is a truly rare event. Thankfully, professional responses by the crew and first responders kept it from becoming a real disaster. Have you ever experienced a rejected takeoff on an airliner? How about an evacuation? What were your thoughts during the event?